Eric Carle is a children's book author and illustrator, famous for his simple, beautiful language and a unique, colorful art style that's immediately recognizable. He's behind enormously popular books like "The Very Hungry Caterpillar," about a caterpillar that eats its way to becoming a butterfly. He's also the author of "The Mixed-Up Chameleon," which follows a bored chameleon who spices things up by imitating other animals at the zoo and learning he's perfect just the way he is, and "Brown Bear, Brown Bear, What Do you See?" 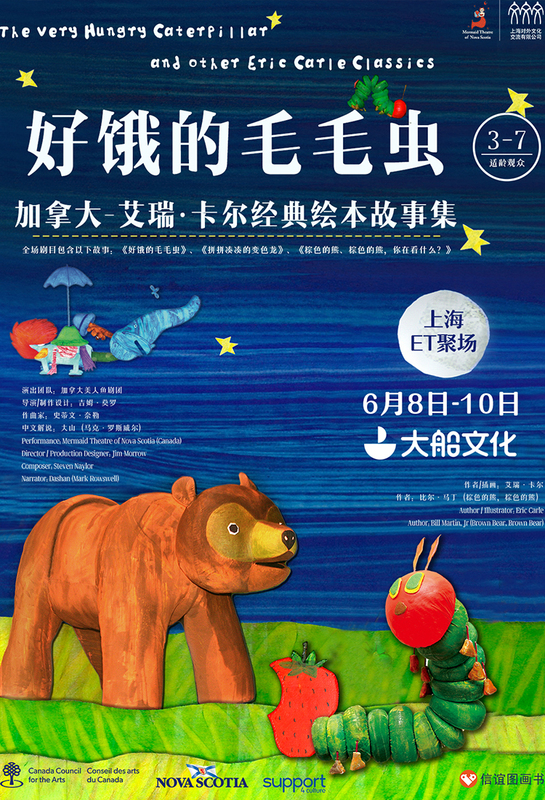 In this 60-minute production by Mermaid Theatre of Nova Scotia, three of Eric Carle's heart-warming tales are brought to life through puppetry and black lights, with narration by China's favorite foreign celebrity, Mark "Dashan" Rowswell. Perfect for children aged 2+. This show is in Chinese.